Since beginning his study of classical guitar in Florence, Italy at the age of thirteen, Carlo Pezzimenti has worked successfully to impart his wealth of knowledge to students of the guitar, to further develop his artistry, and to share his musical philosophy with audiences throughout the world. Summers, Pezzimenti attended Andres Segovia's "Music in Compostela" festivals. Studying with the father of classical guitar, he laid a strong foundation for his musical career. Pezzimenti continued his studies at Loyola University in Rome with Sergio Notaro. Later, he acquired a degree in music from the prestigious Morlacchi Conservatory in Perugia, and furthered his studies with José Tomás in Alicante, Spain. After returning to the United States in 1974, he attended master classes with Jesús Silva, Oscar Ghighlia and Federico Moreno-Torroba. His private studies with Segovia continued from 1980 to 1985 during annual visits to Madrid. Carlo Pezzimenti's Carnegie Hall debut took place in 1982 to great acclaim. Subsequent performances included concerts with the Atlantic Symphony Orchestra, the Dallas Chamber Orchestra, and the Las Cruces Symphony Orchestra. Pezzimenti has gained the attention of the music world through performances in the United States, Europe, and Latin America. His appearances on the concert stage, as well as on radio and television, have received consistent, ever-widening acclaim. Carlo’s understanding of the classical guitar is phenomenal, on the guitar he is like Van Gogh or Eghone Schille , creating music that is sweet and intensely colorful, a balm for the human psyche. Mr. Pezzimenti is a highly respected teacher of the guitar. holding faculty positions at Brookhaven College in Dallas, Texas and at Texas Woman's University in Denton. Students benefit from the vast experience and wealth of knowledge shared by this caring musician. He makes his home in Dallas with his wife, Anita. On this recording Carlo plays new FLETA GUITAR (2005). He had to wait 22 years to have this guitar made(that was how long the waiting list was). The Top wood is very high quality Cedar the back and sides are Top quality Indian Rosewood. This guitar is magical, the tone is musky, sweet and smooth and silky that most top quality guitars from all the big names sound very rough in comparison, it is very clear without being sterile. The trebles are magic, weighty, clear and sweet. â€œDe La Nocheâ€� Reviewed by RadioIndy.com! 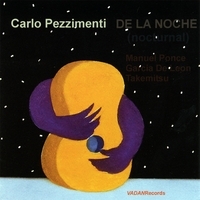 “De La Noche” by the brilliant Carlo Pezzimenti is truly a work of classical art, marked by ingenuity, innovation, and elegance. From start to finish, Carlo’s classical guitar arrangements speak to listeners on many different levels, carrying heavy emotional innuendos. The peaceful and quiet beauty of this CD provides a welcome getaway from our fast-paced world. The recording technique of using ultrasensitive mics without additional effects, provides a beautiful crystal clear guitar sound that makes you feel that Carlo is sitting in front of you as he plays these tracks. “Toccata” conveys the free-spirited nature of Carlo’s guitar work. Moreover, “Preludio No. 3 Observando Nubes (Watching Clouds)” demonstrates Carlo’s ability to make a delightful departure from the confining concepts of traditional musical form. Loaded with 22 soothing tracks, “De La Noche” is a collection of classical guitar work that will provide you a tranquil escape from the distractions of our busy world.